This exhibition offers a look into Gerald Lovell's artistic production at present. Though he has shown widely in the Atlanta art scene and beyond in recent years, this solo exhibition is this first exclusive survey of where he is right now as an artist, and how he has come to define his unique aesthetic. Lovell draws on his quotidian, yet intimate human experiences to divulge the true nature of the lives of his peers, and contemporaries, providing a new, reifying look into a familiar narrative. 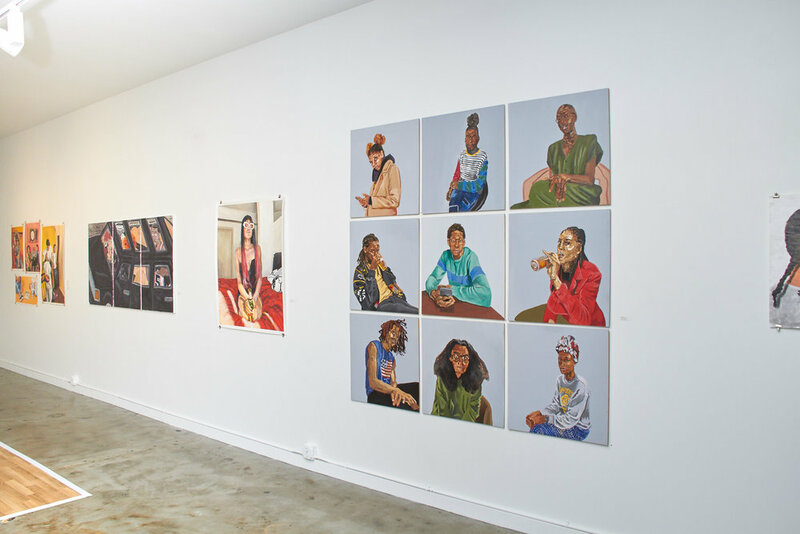 Through his imaginative take on portraiture, Lovell has established an intriguing archive for the self study of the African American millennial, and the society at large. Renaldo Nehemiah, a wardrobe designer, fashion consultant, and creative director in the entertainment industry combines his love of all things creative, passion and expertise as an art collector and curator in this one of a kind exhibition. Art of Atlanta celebrated some of Atlanta’s local artists and gave a platform to some who were up and coming, and promoted the thriving ecosystem for the Arts in Atlanta. LA native, Mariella Angela both literally and figuratively brings together some of the greatest faces in the industry with her larger than life oil paintings. Highlighting some of Atlanta’s most iconic entertainers alongside some of her own hometown heroes, these portraits encompass talent to a T in all aspects of the word. This body of work is meant to be a celebration of what happens when we scratch a surface. Challenging you to look further and within, Travis Love has created a window that reveals what lies beneath when that surface is peeled back; what remains. Embodying the art of skateboarding, Travis uses his acceptance of impurities in order to explore what it means to uncover different layers of ourselves in this exhibition titled SCUFF. T.M.L.B. (Taking My Life Back) featuring Christopher Derek Bruno, Benjamin Niznik and Drew Tyndell is both a group/collective and state of mind that seeks to grab hold of time and maneuver through distractions. Not in the sense of waving a white flag on the present, nor a red, white, and blue flag. This flag of your design. It stands for taking care of your life and time and doing N0W what you truly want with it. Re·Treat can be thought of as a double reward, a second pleasant gift. Some of the best gifts are intangible like time, seeing and being with people you love, reminiscing, and basking in nature. We Are Stars/ Somos Estrellas is a joint exhibition featuring Martin Ferreyra and Pablo Gnecco. Taking inspiration from the Day of the Dead celebration in Mexico, this exhibition, through paintings, ceramics and installations of light and sound, will give the audience a reason to reflect on what could be the reunion with our ancestors and keep their precious memories alive. Don’t @ Me represents the multidisciplinary practice of Pastiche Lumumba, combining traditional high art like painting and sculpture with new media and internet memes. The works in this exhibition manifest the ethos of the internet with interconnected visual motifs, critical discourse, and savage wit. Lumumba’s work is supplemented by a selection of pieces from Nandi Loaf, Zach Fox and Jenson Leonard. HER RITUAL features twenty-three (23) new and original works created by Atlanta-based artists, photographers, designers and filmmakers, focused on the mystery and normalcy of feminal rituals. Each woman explores a ritual through the lens of personal, cultural and familial traditions, as well as non-traditional, modern rituals. Jurell Cayetano, FRKO and Gerald Lovell come together to collaborate in this light-hearted and unique group exhibition, titled TRPL-DBL. Using a mix of dark humor and tenderness, these artists present to us a series of raw intimate moments that celebrate the wins, the loses, the taking chances and the fear of not knowing your next move.